In yesterday's Monday Motivation post, I mentioned how I maintained a time log of my daily actions for several weeks. After taking inventory of how I used my time, I realized a huge opportunity in the evening hours. After being super productive all day, I tended to "veg out" at night, making very little use of that time. Another opportunity identified was in the amount of time invested to taking care of myself. When asked "what can I do to address these areas" the idea of building a nightly routine was born. I'm the definition of the word "morning person." I can get up with very little sleep with just as much vibrancy and alertness as someone who's had a full night's rest. But, on the flip side, by the time evening comes around, my mind slows and signs of grouchiness start to appear. Knowing that I'm not at my best at night, I opted to build my nightly beauty routine in phases. The simpler the routine, the more likely I am to actually do it. As the habit builds, I'll layer on additional steps until I have a complete regimen. So far, I've employed three steps into my routine. Before bed is the best time take collagen pills since it requires an empty stomach. 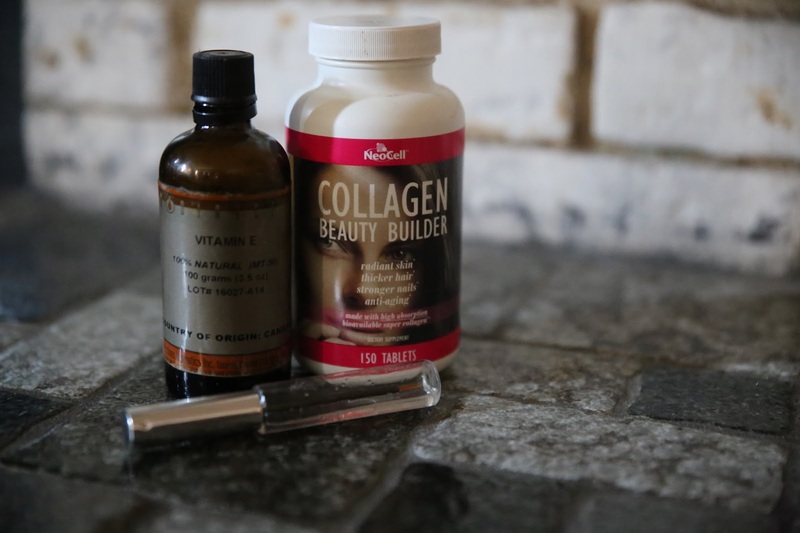 On top of that, I have a feeling that collagen is a highly useful nutrient to have in my system over night to aid in my body's repair and rebuilding overnight. I plan on adding other supplements that aid the nightly rejuvenation process. I'm also practicing the "go to bed greasy" mantra shared by many celebrities to keep their skin glowing. But instead of using Vaseline, I'm opting to use ample amounts of pure vitamin E. Years ago, I added a little vitamin E to my face at night before bed. In the morning, I woke up with a glow and was the recipient of multiple compliments. Not to mention how vitamin E is great for scarring and is an antioxidant (unlike petroleum filled Vaseline). Vitamin E is completely versatile, I take full advantage of that by using it on my lips, under eye, cheeks, everywhere. Finally, I complete the 3 step process by lining my lashes with a castor oil, silk amino acids blend to create high powered lashes. Months back I was consistent with this process and my lashes thanked me. The plan is to start small and consistent rather than trying to do too much and not maintain. Once this habit becomes a bona fide ritual, I'll build on the process. I'd love to conduct a 15 minute face massage session every night and maybe even use an ice cube after cleansing like Jennifer Aniston, Pharrell, and Naomi Campbell. Thank you so much, I always learn a lot when i come here. I will start to build my night regimen. Do you know what is good for blackheads? Awa, for blackheads/clogged skin, I found it best to use mask regularly. I think the Clarisonic does a good job of cleansing the skin deep down. Last but not least, steaming the skin and exfoliating frequently.